Just like early computer enthusiasts compared notes with kindred souls at Homebrew Computer Club meetings, Pop said he regularly shares his results with other data geeks at local Quantified Self meetups. The insights he’s gleaned are fairly modest: he switched from coffee to tea after realizing how profoundly caffeine affected him, and cut his sleep back to 6.5 hours from 8 hours after realizing that’s the optimal amount he needs. But his hobby has shown him the powerful way that feedback loops can change behavior. Now, with his startup Human API, he wants to help developers create more of those feedback loops around the Quantified Self. “[We want] to bring it out of the basement and make it easier to build things with this data,” he told me. 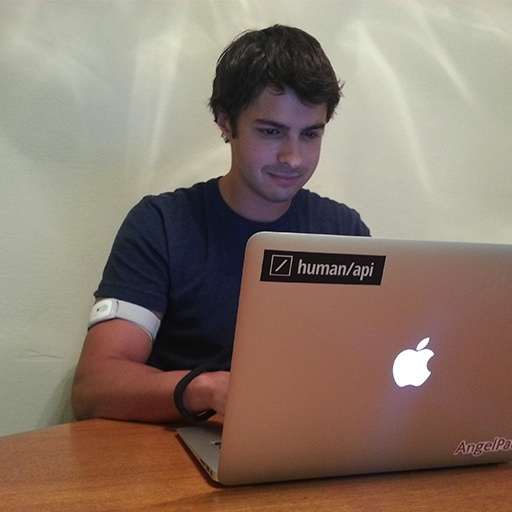 A recent graduate of the AngelPad startup accelerator, Human API is like a “glue layer” for connecting APIs, said Pop, a Romania native who went to college in Vancouver. Not only does the startup aggregate APIs from a range of health and wellness companies – from fitness tracking devices to clinical applications to genetic testing services – it overcomes the technical hurdles of normalizing and standardizing the data to make it easier for developers to use. APIs are starting to come of age in health care. Over the past few years, the U.S. Department of Health and Human Services has been on a “data liberation” mission, opening up nearly a few dozen APIs of its own and calling on the industry to follow suit. In the last few months, bigger companies like Kaiser Permanente and athenahealth have released public APIs and even those that haven’t made their APIs public are working more closely with API management companies like Apigee and the Mashery to privately share data with other companies. As more data flows from sensor technology, electronic medical records systems and other health systems, Pop believes for developers to really take advantage of the growing ecosystem, they need a one-stop shop for using APIs. The goal, he said, is that they should be able to build apps that are essentially device- and API- agnostic. Pop declined to share the exact number of APIs the company currently offers but said that once Human API pulls in the data and normalizes it, it organizes the various APIs into category-specific data streams. Data from fitness trackers, for example, would go in an activity stream so that developers wouldn’t need to develop for specific devices but for consumers who want to use all kinds of devices. While the startup is largely invisible to the average user, the hope is that by breaking down the barriers between datasets, developers will be able to create a wider and better array of options for patients and consumers. But even though more health companies are opening up APIs, some have limited their usage to certain partners and would likely rather that developers build for their specific platform than a whole category of devices and services. How do we make sense of so much data? Human API is part of a growing group of companies and organizations interested in mashing up health-related datasets to reach meaningful insights. Startup Tictrac offers consumers a dashboard for organizing their personal data, while WebMD (s WBMD) and Qualcomm Life (s QCOM) have teamed up to similarly offer a health hub that enables people sync and analyze data from multiple health tracking tools. Non-profit health data efforts include the Health Data Exploration project from the Robert Wood Johnson Foundation (RWJF) and the California Institute for Telecommunications and Information Technology (Calit2), as well as the Open mHealth project. Foursquare co-founder Naveen Selvadurai even went so far as to release his own “personal API” in an effort to get hackers working on ways to build tools that make the most of personal analytics. And clearly there’s an appetite for this kind of data among developers. Human API won’t release any of its data until a June 29th kickoff hackathon it’s organized in San Francisco. But Pop said more than 600 developers signed up in the first 48 hours. What is Andrei Pop’s business model and why would developers want to put their eggs in one centralist “API basket”? This means we’d have to trust Pop’s company to aggregate and normalize everything and then we as developers would become beholden to him and sharecroppers on his land. No thanks. A more strategic move would be for developers to have patience and wait for the likes of Apple’s forthcoming equivalent (maybe Google too). Why? Because if developers are going to become share croppers, its best to choose your land (which you’re going to share crop on) wisely! Choosing a (probably not too distant future) platform for doing this type of stuff such as what Apple will probabilistically offer is a much wiser move given the momentum and TRUST that companies like Apple have already built up with millions if not billions of people on the planet. Sorry, but I trust Apple with my credit card (for iTunes) and its development tools (Xcode) and APIs (Cocoa etc.) more so than Mr. Pop. Don’t you get it Eddie ? This is the main reason startups all start up. They are all here to grow up a bit then go out seling to bigger players. The key point is whether mr Pop’s startup will be the one acquired or another. In this state of being, it is quite improbable for Apple or Google to hit this very spot putting their own manpower at work for just the same purpose. So, if interrested in such area, do follow mr Pop and his competition and be sure to jump in the right boat at the right moment. Now, free tip for mr Pop – if he was to give this to interrested parties as a *server* and not as a service, it would actually be quite a deal.